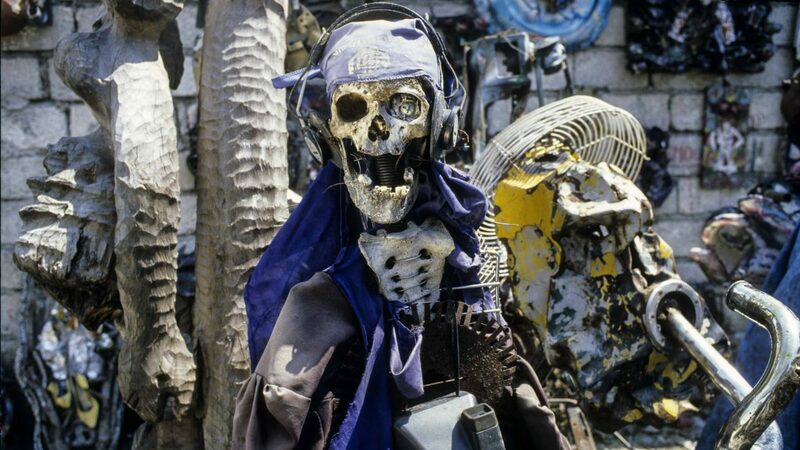 Far from the pre-packaged, plastic Vodou pushed to tourists en masse, Paul Clammer heads to Haiti in search of the real spiritual deal. 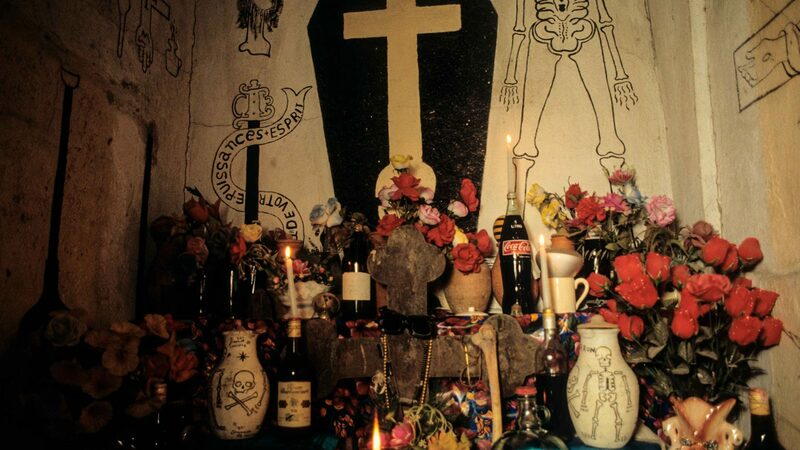 For as long as travelers have visited Haiti, they have been intrigued by Vodou. During the country’s tourism boom of the 1970s’, nightclub floor shows relied heavily on jungle drums and black magic, and chalk-faced witch doctors would appear from a puff of smoke to front advertising campaigns for the national tourist board. A taste of this pre-packaged exotica still lingers today at Labadee, a private beach resort run by Royal Caribbean on Haiti’s north coast. Dancers still writhe to hypnotic rhythms in a floorshow, breathing fire and walking on glass, hoping to lure tourists away from the all-you-can-eat buffet. It’s fun, but as far from a lived religion as it’s possible to get. 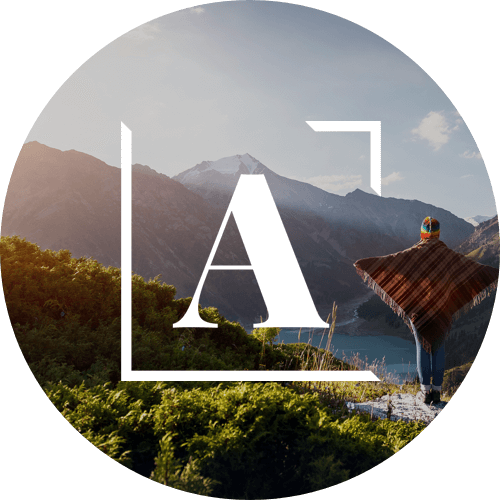 To experience that, you have to head far from the crowds and into the country. 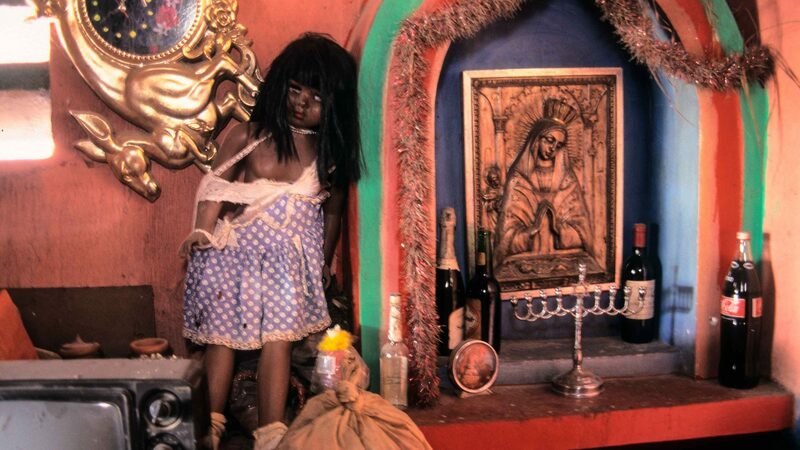 Vodou (the anglicized spelling ‘Voodoo’ is considered pejorative) is not a religion of great cathedrals. Temples tend to be small affairs, tucked away from immediate view, frequently rendering the religion invisible to the casual observer. 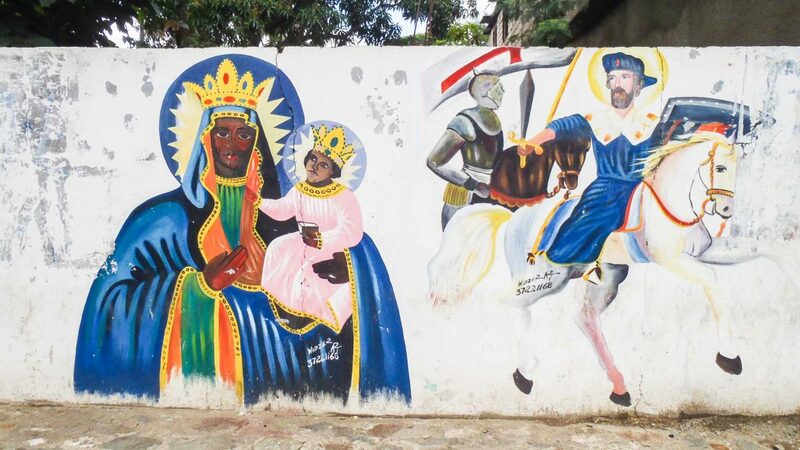 A first-time visitor to Haiti may have heard the old adage that the country is 90 per cent Catholic, 10 per cent Protestant, and 100 per cent Vodou—no wonder they remain baffled. 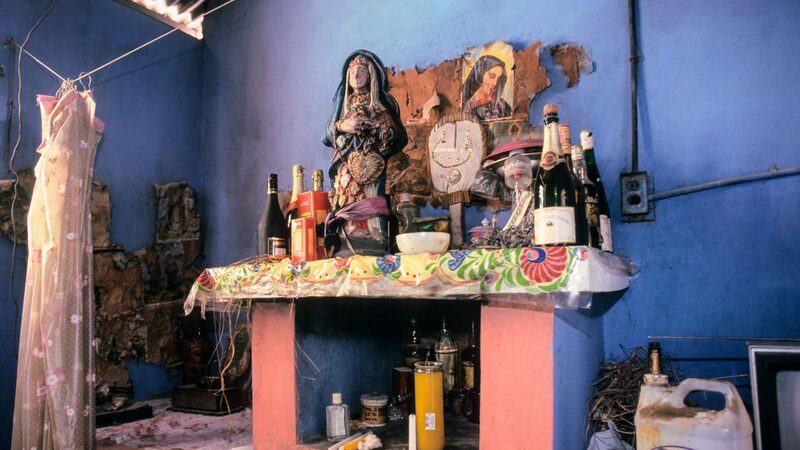 Churches seem to be everywhere in Haiti—so where is the Vodou? On my first visit to Haiti, I was let in on the secret. 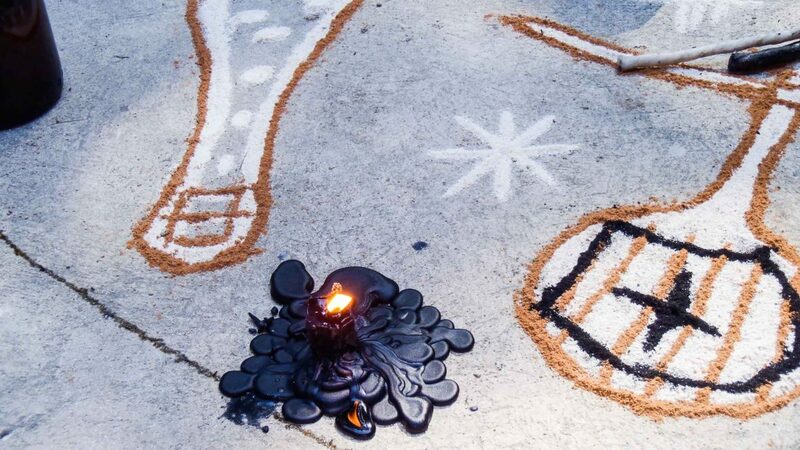 Picture Vodou like a power grid, I was told. It’s everywhere, covering the entire country; you just need to know how to plug in. Cemeteries are a good place to start. Here, even at the graves of Christian believers, you find evidence of the lwa, the Vodou spirits. 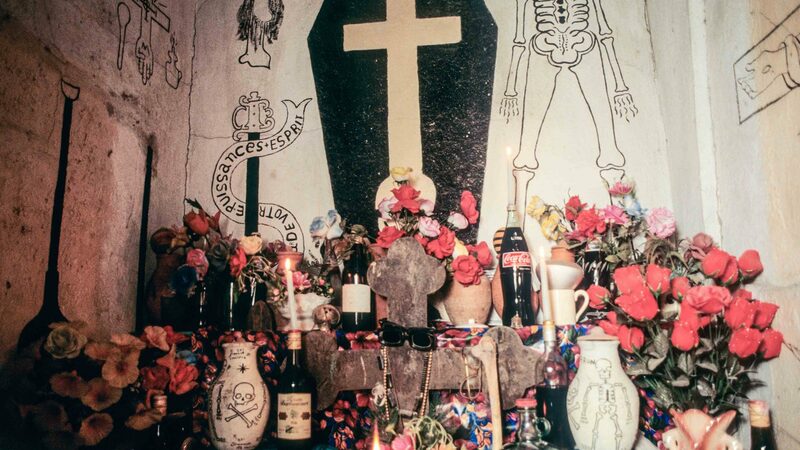 A crucifix may be marked with black and purple, with burnt candles at its base, and discarded bottles of rum represent the offerings made to Baron Samedi, the lwa who guards the passage from the this world to the next, and his wife Brigitte. It’s also common for the recently deceased to have food left out for them to help their spirits back across the sea to ancestral Africa. 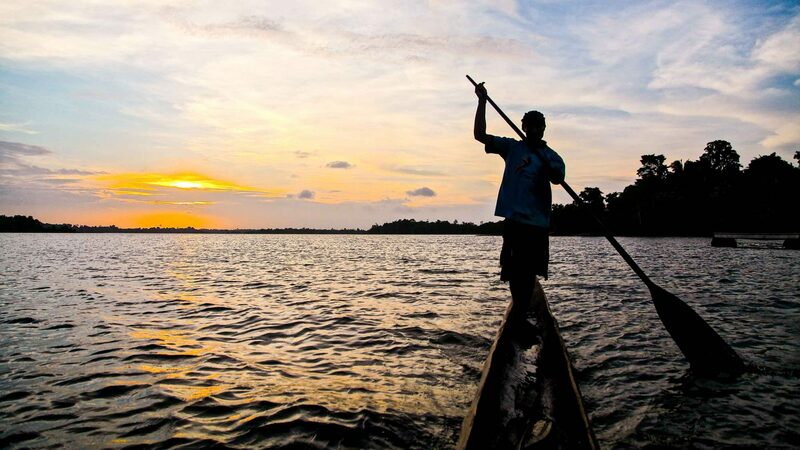 Africa plays a central role in a faith that was borne of the experience of slavery and the Middle Passage. Enslaved Africans brought their religions with them to the colonies, religions that were then blended with the Catholicism of their colonial masters, creating a belief system unique to Haiti. 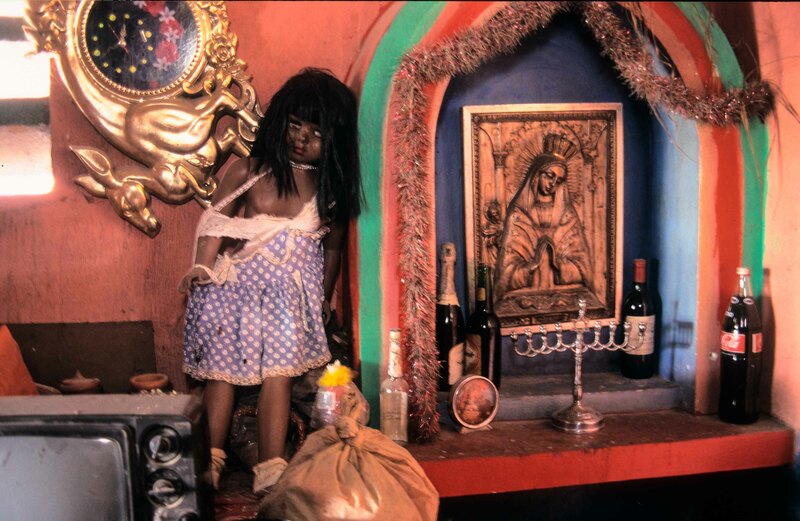 In Vodou, Africa is known as Ginen, the mythical land of their spirits. But look carefully, and the signs are everywhere—the charms in the trees, the candles burning in unexpected places, and the saints and veve painted on walls. The lwa have their counterparts in the Catholic saints, and a first visit to a peristyle (Vodou temple) often surprises as you’re confronted by a parade of Christian icons: The Virgin Mary standing in for Ezili Freda, the lwa of love; Damballah, the Sky Father and snake that created the world as St Patrick; and St. Peter guarding the keys to heaven—now portrayed as Legba, master of the crossroads between our world and that of the spirits, to whom prayers are always offered first at any Vodou ceremony. The syncretic nature of the religion reaches back even further into the history of the land. On the edge of the coffee-growing town of Dondon are a series of caves covered with petroglyphs carved by the original Taíno inhabitants. At their deepest points, these carvings are surrounded with ritual symbols called veve and votive charms known as paket kongo used in Vodou: The believers of today draw power from such sites, places that have been used for worship since before Columbus landed on the island. 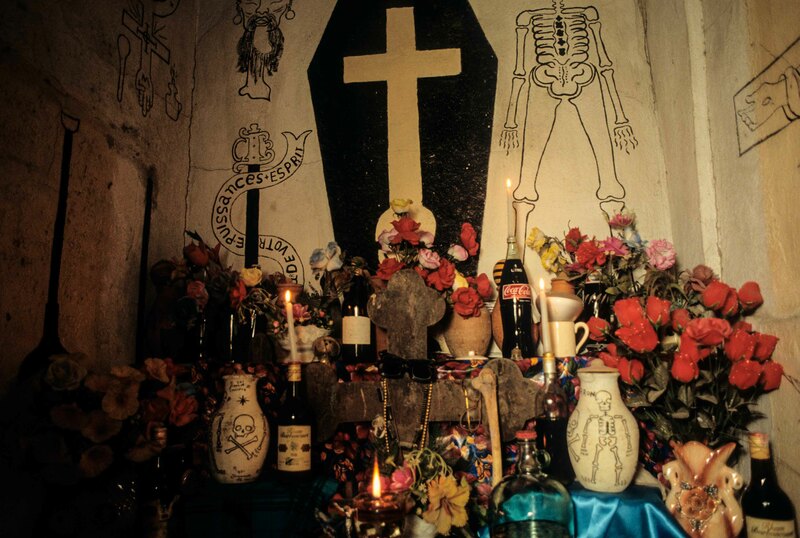 Vodou may have originated from slavery, but it also helped inspire the revolution that overthrew it. 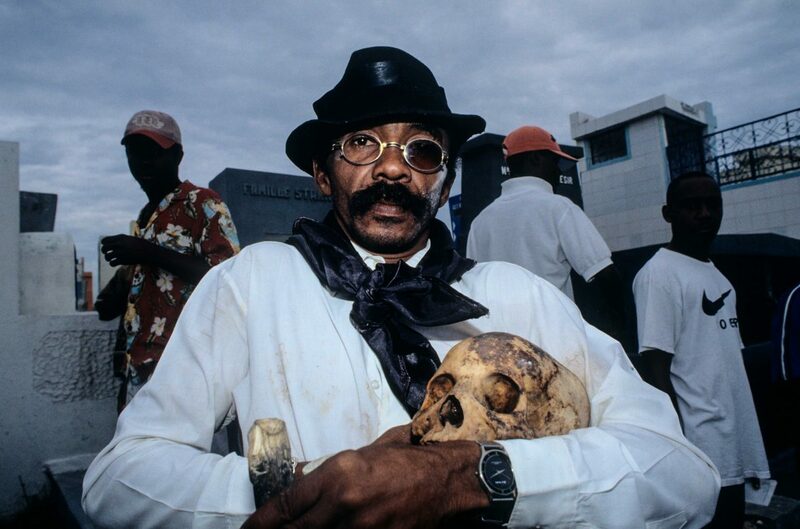 The catalyst was a Vodou ceremony that took place at Bois Caïman, near Haiti’s second city of Cap-Haïtien—this is where the first conspirators pledged to rise against their oppression, led by Vodou priests Boukman Dutty and Cécile Fatiman. 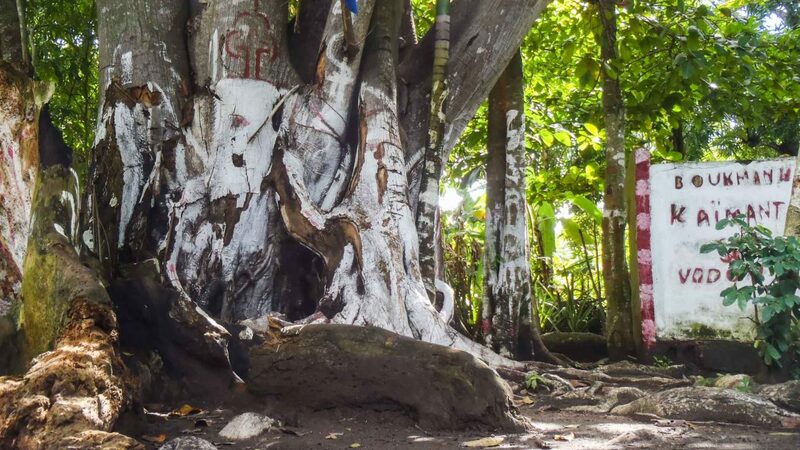 A village of the same name stands there today, where a huge sacred mapou (a tree particularly beloved of the lwa) grows on the alleged site of the ritual. 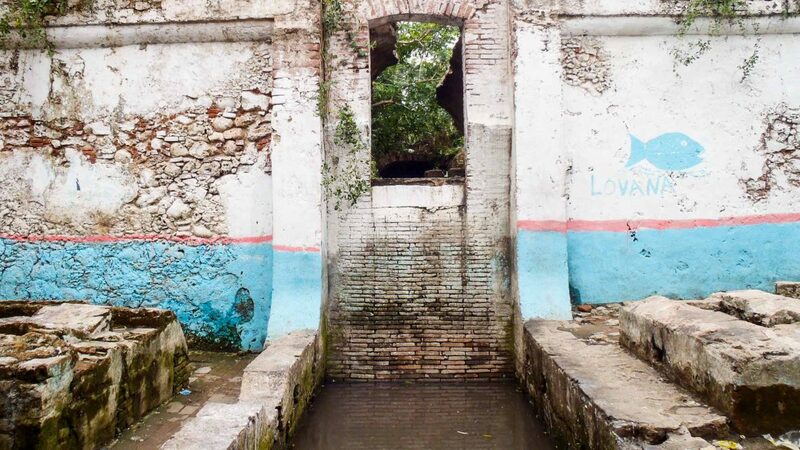 An hour’s walk into the hills are a series of sacred caves painted in red and blue—the colors of the Haitian flag—and images of the warrior spirit Ogou Feray who inspired revolutionary fighters during the revolution. Stubs of candle were still burning when I visited, left by visitors wanting to honor their ancestors. A few days after seeing the caves, I was taken to another place that claimed to be the site of the Bois Caïman ritual; later still, I heard of at least two more. One was past the ruins of Breda, the plantation where revolutionary leader Toussaint Louverture was born. After the tracks gave out, past the fields of sugarcane, we approached the stump of a mango tree where my guide told me Legba would judge if my intentions were pure enough to visit the sacred spot. Drawing level, a white butterfly appeared from nowhere and landed on my shoulder. After 10 seconds of contemplation, it flew off. The judging of the lwa complete—I was assured we could now continue. Another mapou tree marked the spot, but there was no way to tell if this was the ‘real’ Bois Caïman either. Perhaps, as the revolution burned across northern Haiti, the slaves felt that Bois Caïman was everywhere. 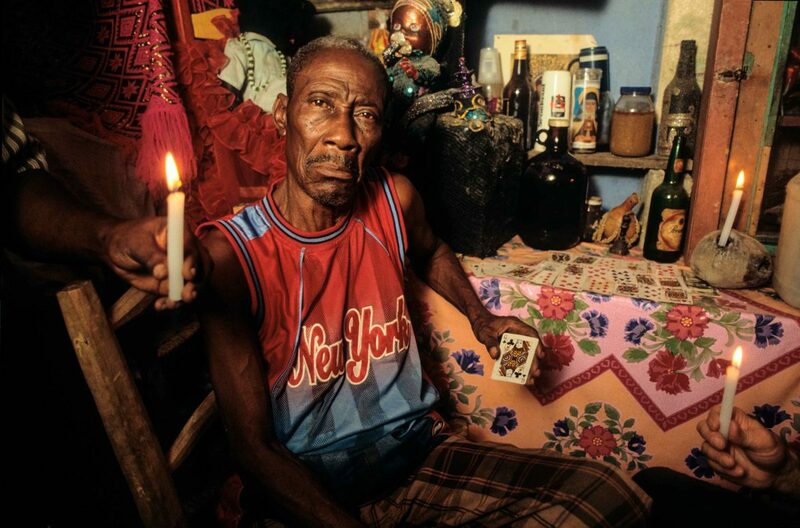 Africa continued to water Vodou roots even after the revolution. 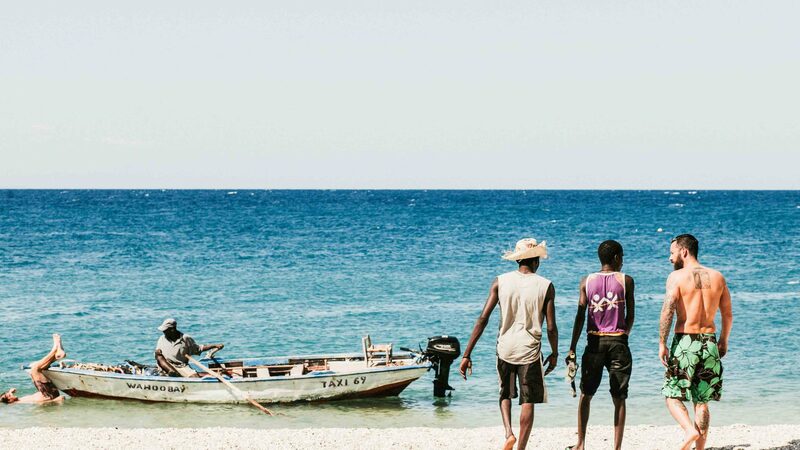 Near Gonaïves is the sacred pilgrimage site of Souvenance which, according to oral tradition, was founded after the freeing of prisoners from a captured slave ship on the nearby coast, soon after Haitian independence. 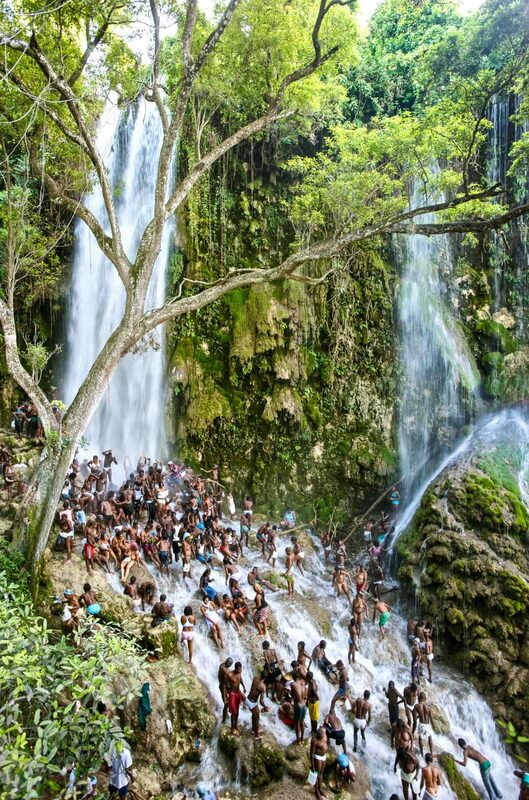 In other locations, Vodou still sits behind its Catholic veneer, such as the waterfall of Saut d’Eau; every July, pilgrims visit the spot where a vision of the Virgin Mary once appeared, matched in numbers by those taking the waters to offer prayers to Ezili Danto, the main lwa or senior spirit of one of the Vodou families. 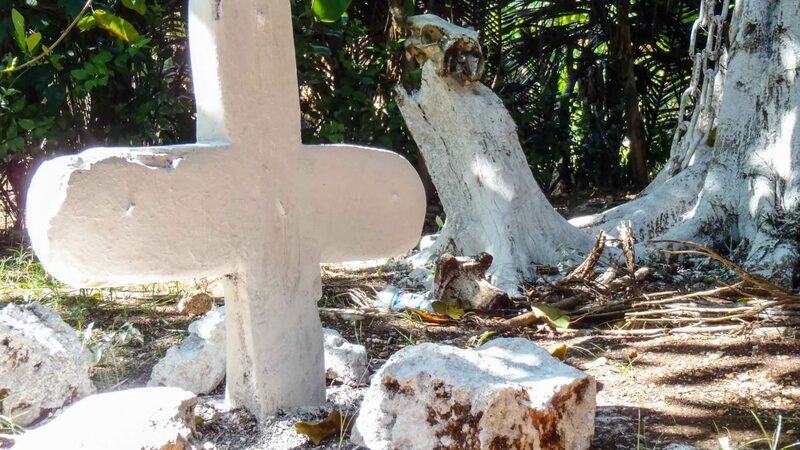 Away from these major sites, the evidence of Vodou can seem hard to spot in Haiti. But look carefully, and the signs are everywhere—the charms in the trees, the candles burning in unexpected places, and the saints and veve painted on walls. You just need to plug in. 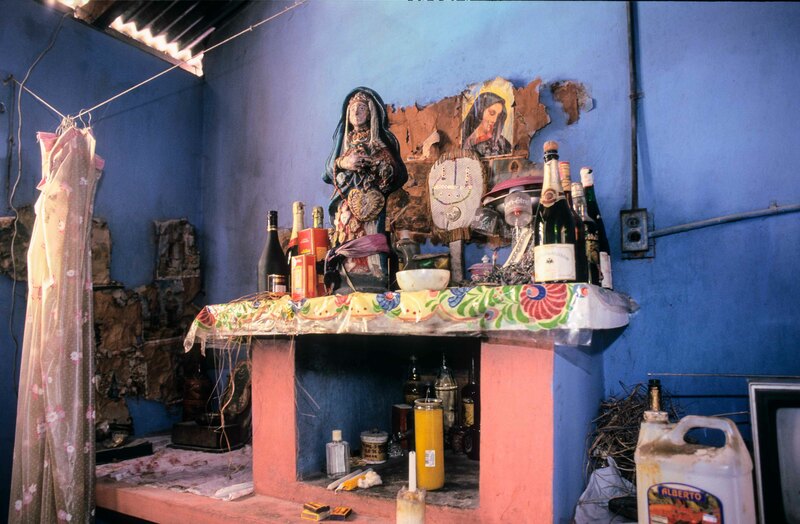 Find out more about Haiti’s historic Vodou sites at Mapping Haitian History. 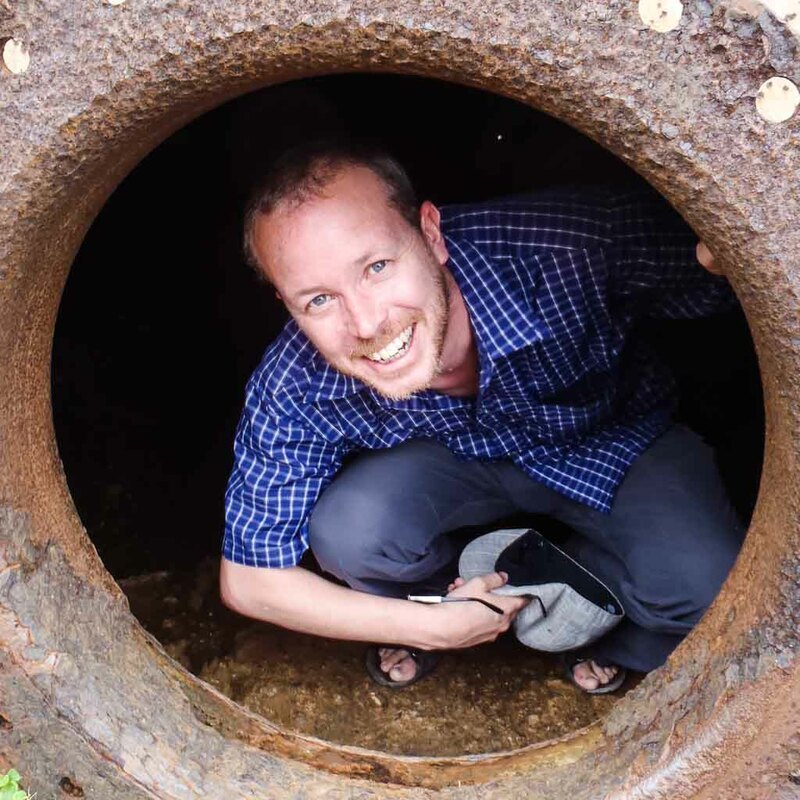 Paul Clammer is the author of Haiti – Bradt Travel Guide. 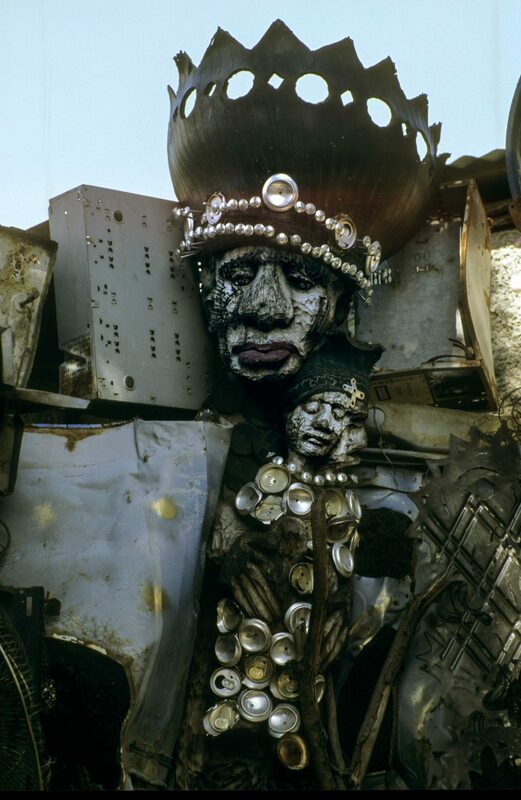 Photography by Leah Gordon, an artist and curator whose work documenting Haiti has been exhibited internationally. And, among other honors, she is also the co-director of the Ghetto Biennale in Port-au-Prince. View more of her photography of Haiti through the decades on her website www.leahgordon.co.uk. The author’s fee for this article was donated to the Kim Wall Memorial Fund in memory of a much-missed journalist and the work she did in Haiti. 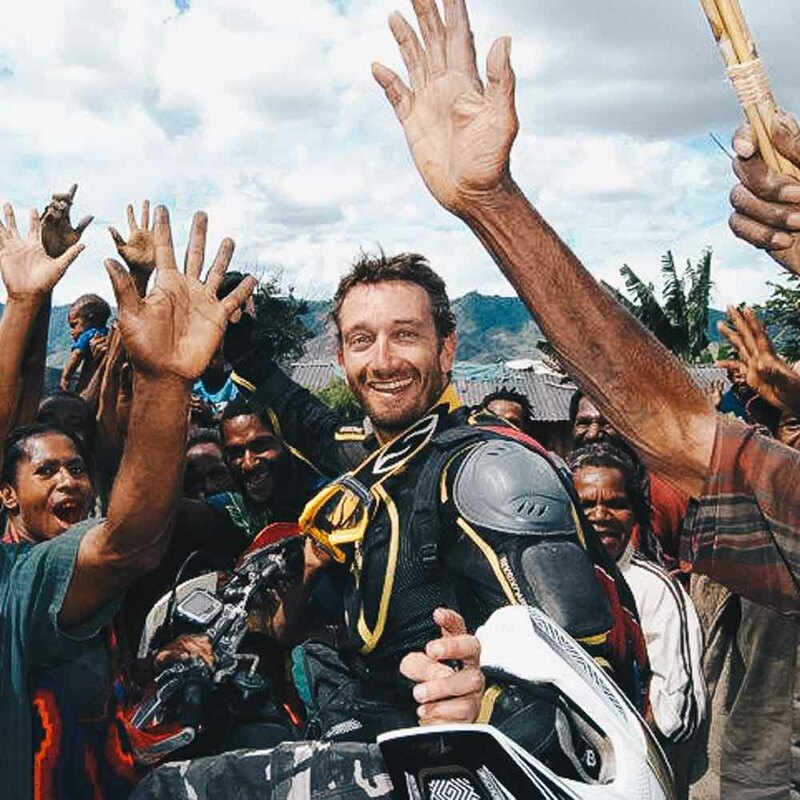 A one-time molecular biologist, travel writer and guidebook author Paul Clammer has written or contributed to over 30 Lonely Planet guides including Jamaica, Jordan and Morocco, and is the author of Bradt's Haiti guidebook.